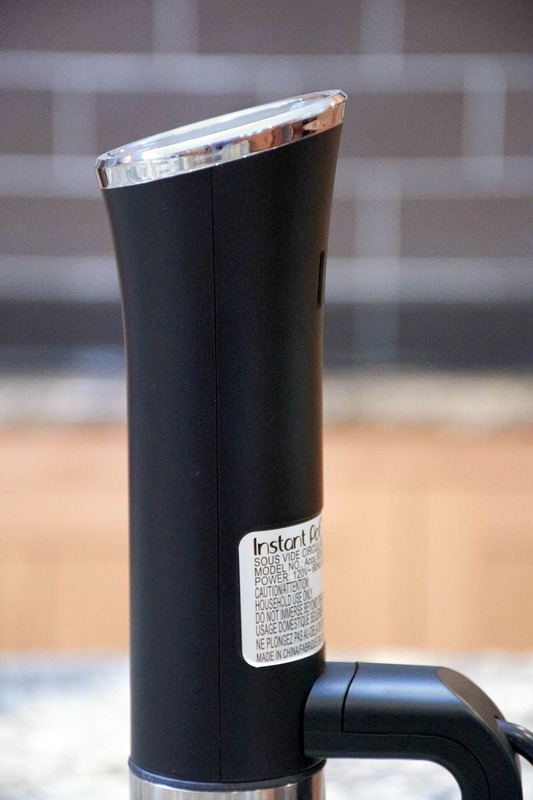 This is a detailed review of the SSV800 Accu Slim sous vide circulator, an inexpensive sous vide immersion circulator recently released by Instant Pot. 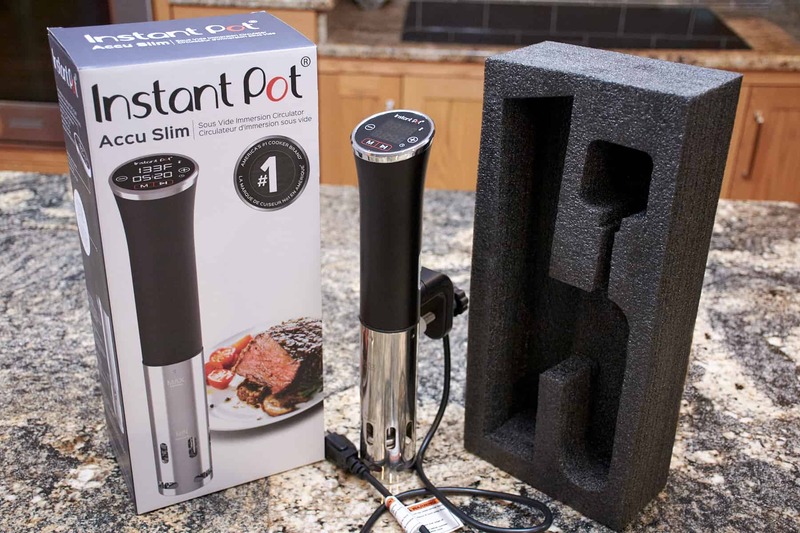 We were fortunate that Instant Pot sent us an Accu Slim to test for this review. If you're not into details you can go directly to my Accu Slim Summary and catch all the highlights of my analysis. Now let's get started with the Accu Slim review! The chart below lists the basic specifications published for the Accu Slim. Please refer to this as necessary as I highlight some of the specifications. Unfortunately, Instant Pot does a relatively poor job of providing detailed specifications in their literature and advertising. And in some cases, the details they do provide are inconsistent, sometimes even in the same document. I did my best to provide the ones I could and listed an "NA" for those that were not available. The picture above may look like an immersion circulator family photo with Mommy, Daddy and Baby. But its actually the Instant Pot SV800 and SSV800 Accu Slim with the Anova Precision Cooker. As you can see the SSV800 Accu Slim is about 2" shorter, and both the top and tube of the device are narrower, than the SV800 and the Anova. The Accu Slim is also about 20% lighter than the other two circulators. This means the Accu Slim takes up less room in the water bath as well as your kitchen drawer when stored. However, the ChefSteps Joule is still the smallest immersion circulator being another 2" shorter as well as narrower and lighter. But it's also considerably more expensive. The clamp on the SSV800 Accu Slim is permanently attached to the body of the unit, unlike the clamp on the SV800 which is a sleeve, allowing the unit to slide up and down in the clamp. Consequently, the Accu Slim is much more restricted as to the size of water bath container it can be used with. I don't know this is a big deal since it will work with containers that are at least 5.5" deep, which is the vast majority of containers people use for sous vide, but it is worth mentioning. The Accu Slim is constructed of material similar to most immersion circulators today. The top of the unit is made of sturdy polycarbonate and the portion in the bath is stainless steel. Often when considering the purchase of an immersion circulator folks don't give much thought to cleaning the unit. But if you have hard water like I do or have experienced a sous vide bag leaking on a long cook, then you know that cleaning can be an important factor in your purchasing decision. The removable stainless steel skirt on the Accu Slim makes it extremely simple to get into the "working" parts of the unit and keep them clean. Perhaps the greatest feature of the Accu Slim is its low cost. Occasionally, some other immersion circulators will be on sale for a similar price, but the Accu Slim is one of the few circulators with a consistently low price. 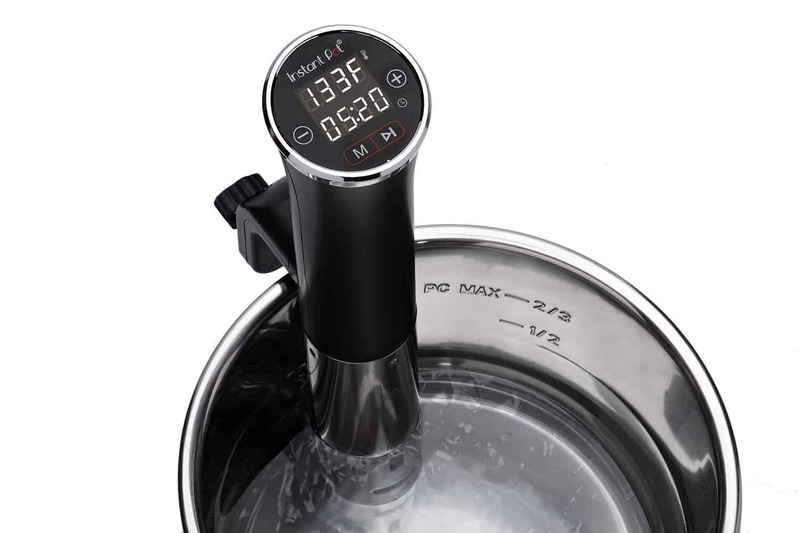 The primary function of a sous vide water bath is to maintain a precise low temperature during the entire duration of the cooking cycle, which could be minutes or days. There are numerous factors that go into determining how well the Accu Slim immersion circulator can perform this function. Please refer to the chart below as needed as you read through this section. Since Instant Pot does not specify either the pump speed or the maximum water capacity for the Accu Slim, it is difficult to determine how large of a water bath container the Accu Slim could handle. But from my testing, it worked fine in my 10 L water bath container. At 800 Watts the SSV800 Accu Slim is one of the immersion circulators on the low-end of the power spectrum. This typically means it will take it more time to reach the target temperature when starting a new cook. This may, or may not, be a concern to you personally. If it is important, the Joule and Gourmia GSV130 have the highest wattage specified. Also, there are a few different ways to help ameliorate this shortcoming. At the time of this writing there was only one five-star review on Amazon. Although Amazon reviews cannot always be trusted, if there is a large number of them, it's normally a pretty good indicator of the quality and performance of the product. Hopefully, over time there will be more reviews which you can look at to determine people's response to the Accu Slim. One thing which I do believe is a good sign, however, is that if you look at the ratings of the other Instant Pot products, they are usually highly rated with thousands of reviews. The prior two sections presented the specifications for the Accu Slim. This section will demonstrate what actually happens when the "rubber hits the road". We have created the "Sous Vide Machine Benchmark" that runs the immersion circulator through a series of lifelike scenarios to see how it operates "in the real world". The results of the benchmark are shown in the table above for the SSV800 Accu Slim. You can learn more about the Sous Vide Machine Benchmark and see how the Accu Slim compares with other sous vide machines we have benchmarked. Overall the benchmark results for the Accu Slim immersion circulator are quite similar to those of most other circulators. The biggest differences, as mentioned above, are the longer start times of the Accu Slim. These may, or may not, be an important factor in your purchasing decision, depending on how you use your immersion circulator. To be fair, it's worth noting that the start times for the Accu Slim are slightly faster than for the 800 W, Bluetooth version of the Anova Precision cooker, which we recommend. Because of the simplicity of the device itself, it is quite straightforward to quickly get your cook underway. Since it only has manual controls there's no need to do any syncing to your smartphone etc. It is intuitive to enter the target temperature and cooking time from the control panel, then hit the Start button to get things cooking. The control panel of the SSV800 Accu Slim circulator has two bright readouts for temperature and time, which are easy to read (With an exception listed below in the "Nits"). You press the Mode button to switch between setting the temperature and the time. I am confident that the designers of the Accu Slim had many good reasons for selecting the angle of the display on the control panel of the circulator. And I presume that the majority of people have not given that particular characteristic of the device much thought. Unfortunately, I am in a fairly unique position in that I am in a wheelchair and thus my eye level is quite low. As a result, it is impossible for me to operate the Accu Slim since I cannot see the displays or buttons. In order to run the sous vide benchmark I had to have my wife operate the circulator for me. This would also be an issue for anyone on the shorter side, including children. So this will be a big negative for anyone who likes involving their children in the kitchen or is shorter than average. If that fits your situation I would recommend the Anova Precision Cooker or Nano, which have front-facing control panels. I also feel that a more vertical angle would make it easier to view the temperatures from across the room, regardless of your height. We recently did a poll in which only 14% of the people indicated they use the timer on their machine, and only 29% of people use the timer on an app. Neither Jason or I use the timer. My two main reasons for this are the following. First, I typically set the "done" time on my phone so that, no matter where I am, I can keep track of when the cook will complete. Second, and by far the most important, is that I do not want the circulator to shut down at the end of the cook time, which could let the water bath cool down into the danger zone if for some reason I get delayed in removing the protein from the water bath. One of the advantages of cooking sous vide is that you have a much wider margin of error on your cook times. In other words, if it cooks for an extra hour or two, in most cases that will not be a problem - at least it will be safe to eat. On most immersion circulators, if you do not set the timer, it does not come into play at all. Therefore, you can simply set the target temperature and hit start and your off and cooking. Unfortunately, with the Accu Slim, you are forced to set the timer, or it will shut off in 4 hours. This is an unnecessary hassle that could be a real problem if you forget to set it and then be surprised when you return home to a cool water bath and a ruined steak. 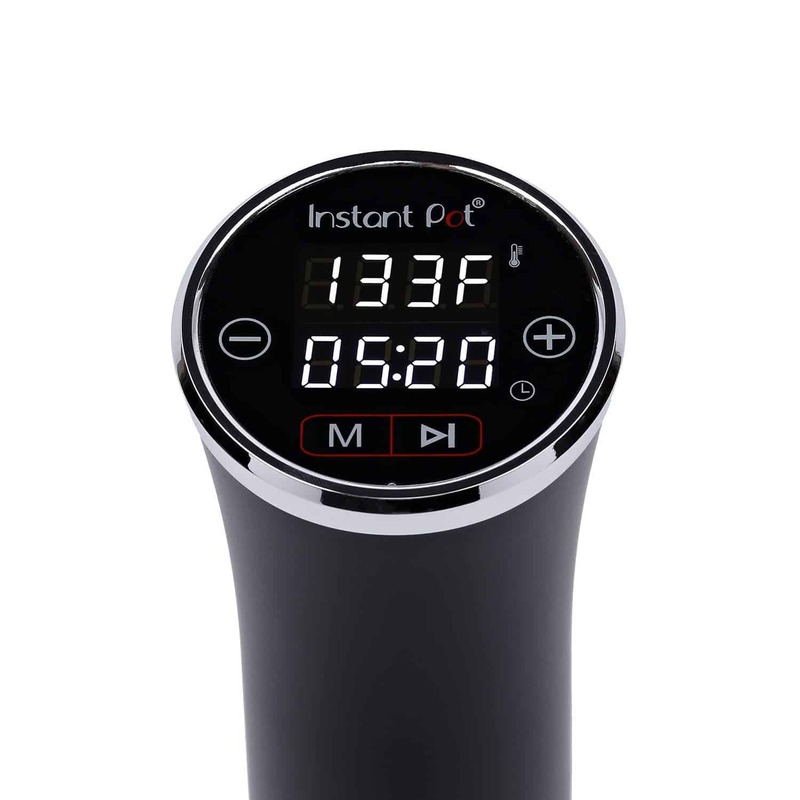 The SSV800 Accu Slim is the second sous vide immersion circulator marketed by Instant Pot. I definitely prefer it to the SV800 because of its smaller size, lower price, and similar performance. The Accu Slim is very plain and simple, no fancy bells and whistles, but I feel that's one of its strengths - this simplicity makes it quite easy to use. The performance of the Accu Slim puts it about in the middle of the pack of available sous vide immersion circulators. It does a good job of maintaining a consistent temperature in the water bath, which of course is the most important function of the device. It should be plenty powerful enough to work in a water bath with the capacity of 4 to 5 gallons. An important feature of the Accu Slim is its low cost, $80 at the time of this review. This will allow someone who wants to try sous vide cooking to get in at a very reasonable price. 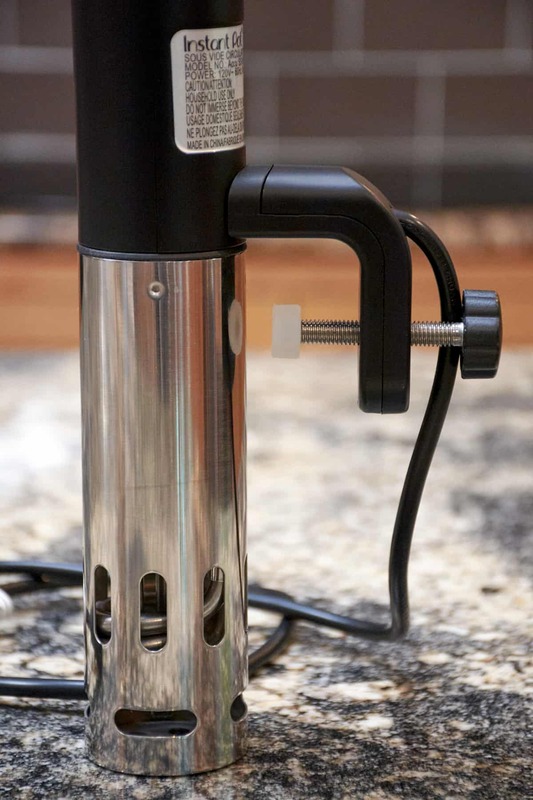 However, if price is your primary purchasing criteria, I would encourage you to be patient and watch out for sales of other sous vide immersion circulators which are normally priced higher. Often they may have sales that price their circulators at a similar price. For example, Anova Culinary recently had a clearance sale on their Anova Precision Cooker (Bluetooth - 800W) device for $79. In my opinion, that would be a better purchase. 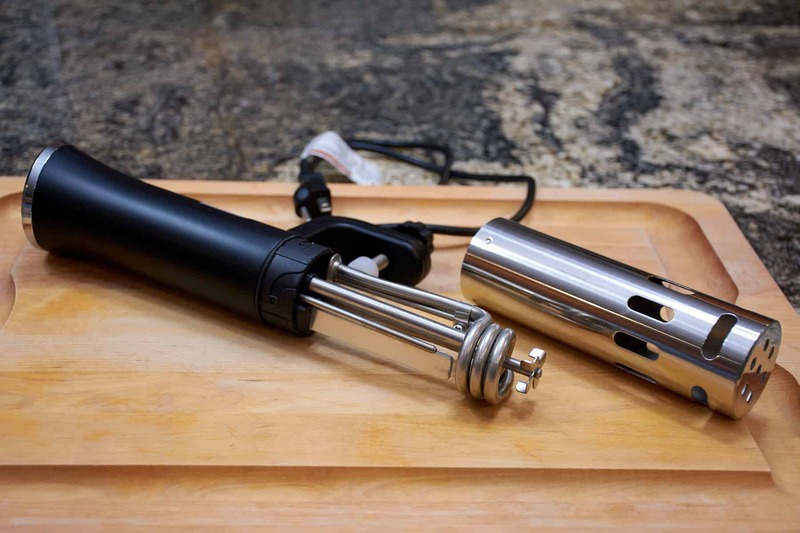 I hope this review of the SSV800 Accu Slim has provided you with the information you need to make a well-informed purchasing decision regarding a sous vide immersion circulator. I encourage you to explore the site for reviews of other sous vide machines. 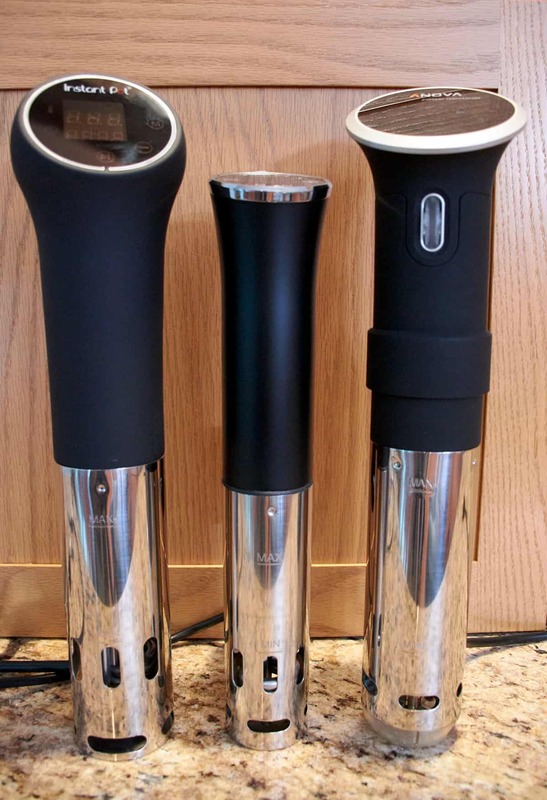 If you do purchase an immersion circulator you may be interested in looking at our reviews of Sous Vide Water Bath Containers. If the SSV800 Accu Slim sous vide circulator sounds like something you would like, you can get it on Amazon. If you have experience with the Accu Slim, I would appreciate you sharing it in the comments below. Thanks.